So I’m slightly addicted to Pinterest, when the app is actually working on my iPhone. I typically browse the food category because who doesn’t like looking at new recipes and pretty pictures of food. I saw this pin and knew I had to make it into a cupcake. And so I did. 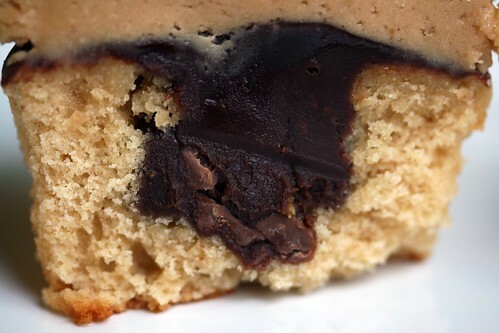 I made these with my husband in mind who really likes peanut butter. Rather than making a chocolate cake I decided to go with Martha Stewart’s peanut butter cupcakes. Oh My Goodness. Best peanut butter cupcakes I’ve ever had. Martha wins once again. I made the cupcakes like normal and then cored a hole in the middle with a cupcake corer I found at Target. I filled the cupcakes with the ganache being mindful that each one got some Reese’s peanut butter cups in them. I had saved some of the ganache before adding the peanut butter cups so after I filled them I also dipped the tops in ganache. 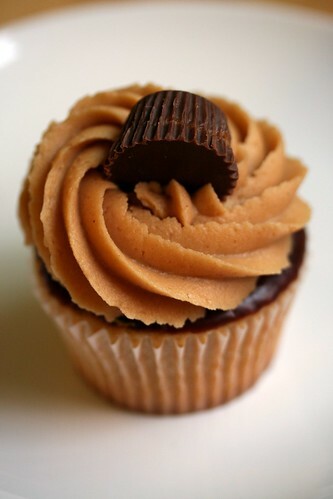 Then I topped with the peanut butter frosting and added a mini peanut butter cup on top. These cupcakes are to die for. Whisk dry ingredients in a large bowl. Cream butter and sugar with a mixer until light and fluffy. Add peanut butter. Add eggs, 1 at a time, beating after each addition. Mix sour cream and vanilla. Add dry ingredients to mixture. Scrape sides of bowl.